A story on how fair trade impacts Media, Pennsylvania, universities across the United States, and the world. As I began working on this story, I had mixed ideas on what fair trade actually was. Yes, I knew that there was some kind of ‘fair trade’ going on, but I did not know how beneficial it is to global communities. To begin, I looked at Media PA, which is known for being America’s First Fair Trade Town. Hal Taussig, the creator of the movement, encouraged to move the town in a direction of fair trade. Because retailers agreed to sell Fair Trade items and businesses began to use Fair Trade items, Media was established as America’s First Fair Trade Town in 2006. Since then, more than 20 businesses, retail locations, and restaurants have been supporting the effort of fair trade. To educate the public on the effects of fair trade across the globe, Coyopa Films created a video to explain the basics: merchants must be paid a fair wage, children must not contribute to the labor unfairly and must receive an education, gender equality must be honored, and we as the consumers must receive excellent products in return. Through this “fair trade” of objects by cutting out the middle man, the merchants abroad receive the money they deserve for their outstanding product, whether it be instruments, tea pots, jewelry, coffee, or chocolate. Another criteria for becoming a fair trade town was for the town to create a lot of media coverage. Various blogs and websites such as Treehugger, Change.org, Organic Consumers Association, and Fair Trade Towns USA have covered the story of Media PA and how this town has inspired many other towns across the United States to become Fair Trade Certified as well. There are 300-plus designated Fair Trade towns in Europe that all work to not only support fair wages but also to reduce their ecological impact. This is what inspired the town of Media, Pennsylvania to anoint itself as the first “Fair Trade town” in the United States. On July 12, 2006, Media, Pennsylvania became the first Fair Trade Town in U.S. Through a collective effort of the people in the town, they came together to raise awareness of the Fair Trade movement and see to it that their town upheld their same values for social justice. 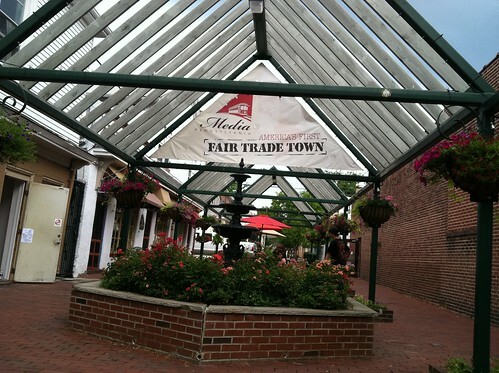 Media, PA is first fair trade town in U.S.
MEDIA — ItÂ’s official. Not only is this tiny borough, the county seat, known as “EverybodyÂ’s Home Town,” it became the “First Fair Trade Town in the U.S.” as shoppers and strollers enjoyed MediaÂ’s Second Saturday of the Month event. The Fair Trade Towns USA campaign is based on principles and guidelines set forth by Fairtrade Towns in the U.K., where the first Fair Trade Town, Garstang, Lancashire, was recognized in 2000. Following a successful campaign to build support for Fair Trade among area schools, churches and retailers, the city council voted unanimously to declare Garstang the “World’s First Fair Trade Town”. Media has inspired 23 other towns in the US to become Fair Trade Certified, including San Francisco California, Chicago Illinois, and Boston Massachusetts, all of which I have visited in the past two years or so. .
All across the country Fair Trade supporters are making a difference, not just by converting their own purchases to Fair Trade but by working with offices, schools, community organizations and retailers to convert theirs as well. Recently, I took a trip to San Francisco. This city became Fair Trade Certified in 2008 and has been growing within the fair trade community ever since. Thanks to the overwhelming response to fair trade (accepted by Bay Area Rapid Transit (BART) and the San Francisco Bicycle Coalition), the Bay Area Fair Trade Coalition helped Berkely CA become a fair trade town and is in the process of helping Oakland CA as well. On the official Fair Trade Town’s website, virtual visitors can read about how close Oakland is to becoming a fair trade town by the highlighted milestones which include buliding a team, reaching out to retailers, engaging your town, aquiring good press from the media, and passing a fair trade town resolution. The Fair Trade Oakland campaign was started as part of the Bay Area Fair Trade Coalition and seeks to unite the greater Oakland community around the principles of Fair Trade. Not only is the Fair Trade Federation inspiring American towns and retailers, but Canadian ones as well. 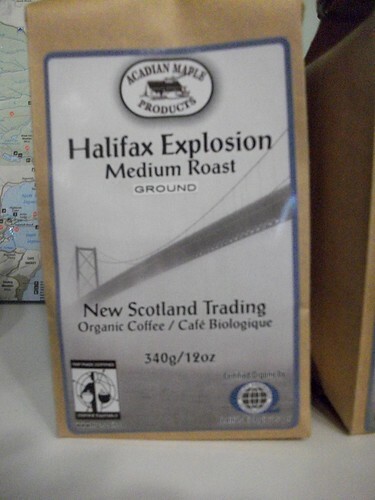 On my more recent trip to Cape Breton Island, Nova Scotia, I came across “Halifax Explosion”: a fair trade certified product from Halifax, Nova Scotia, that had ended up in a corner store in Cheticamp, population 4,000. Fair trade is not only very popular to the citizens of Media, PA, but is also very important to them in terms of their businesses. Many people in the fair trade video express that they are proud of promoting fair trade for the consumers who come to Media. The owners of stores, residents, and founders of foundations in this video also stress that they are pioneers in blazing the trail for fair trade towns in America, and they are proud of it. Hal Taussig states in this video that he feels pride in Media for taking on a personality with fair trade. Another great idea presented by Fair Trade Towns USA is Fair Trade Universities. Institutions such as the University of Wisconsin Oshkosh have used coffee as a selling point for college students to bring fair trade into their school. Lets face it, we’re going to buy coffee anyway. Why not help by supporting a global community? Throughout this project, I have learned that fair trade is a positive solution for everyone. We in the first world country receive a delicious, beautiful, or exquisite product from a talented individual in a third world country who receives fair pay and education in return.